He has this ridiculous muffled chuckle that you can barely hear and sounds like a grunt. I was lucky to inherit it from him. Happy Birthday Daddy! Love you! 9.5mph is a 6:17 pace and the fasted I’ve ever run! The whole time I was thinking “how in the world do people do this for 26 miles?? I never found the answer. After my run I rounded out the hour with 10 minutes on the stairstepper before stretching and abs. Great sweaty way to start my week. 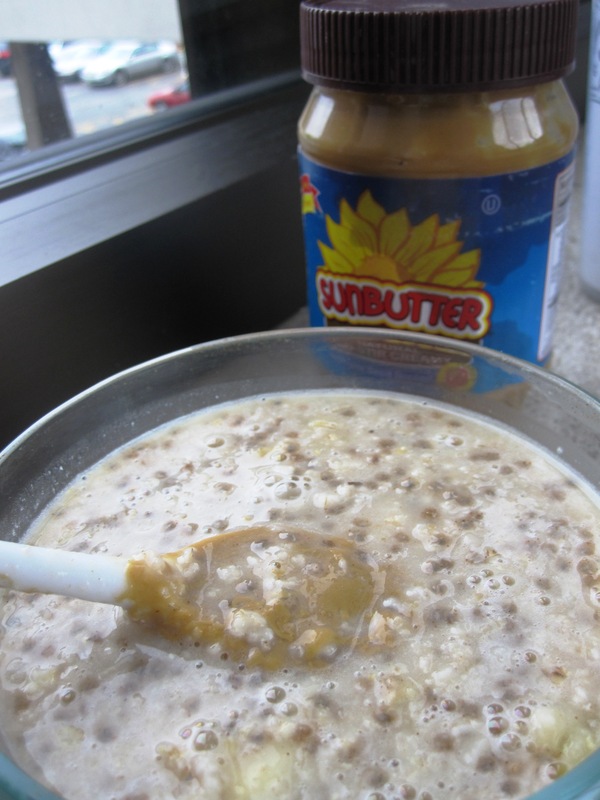 Soupy banana chia oats (too much water) with Sunbutter. Stay tuned for a really random Monday Man-Day post later this afternoon. Have a great day! Quick! Tell me something about your dad! Happy birthday to your dad!! Have a fun dinner with him! You look perfect for a birthday dinner. My dad is amazing! He’s short, bald, and the most wonderful teacher I know. Haha! He also makes a MEAN gin and tonic with lime. It’s my dad’s birthday too!!! 🙂 Yay for dads! I love that skirt! Something about my dad is that he is a Husker fanatic..our garage is more of a Husker man cave than a place for vehicles! Lol. Sometimes I think he would rather live out there! He is a great guy though! I am definitely a daddy’s girl at heart! adorable shoes! And Happy Bday to your dad! Fun fact about mine–he PRed at his half marathon yesterday 🙂 Rockstar! Fun fact: My dad could live off dark chocolate peanut butter cups from Trader Joe’s. 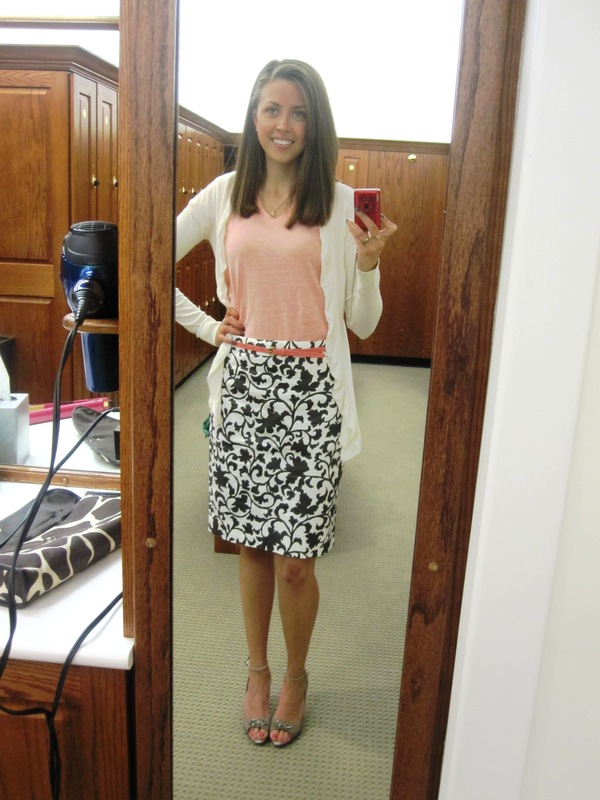 Have a great day, and I love that skirt!! Your dad seems like an awesome guy – happy birthday to him!!! And the thing I love about my dad is that he can put anyone at ease with his mild nature, sense of humor, and caring personality! 🙂 Have a great day! I love how your dad could live off of chocolate cookies and bagels, mine could definitely have peanut butter cookies for the rest of his life and be well-satisfied! Happy Birthday to your daddy!! I love your outfit, super cute especially the skirt and the adorable shoes. Happy bday to your adorable daddy! My Dad was a stydent at ND in the late 40’s when they still said said the daily rosary and had prayers at the Grotto! He was a season ticket holder, and he and my Mom started their honeymoon in South Bend! There is something magical about Notre Dame! Happy belated birthday to your dad! One thing about my dad is that his nickname is Cowboy yet he has probably rode a horse like twice in his life.